Its been a long, long while since I heard from this bunch; after a period of hallucinogenic trippy dance infused music I had stopped really listening to them, so was more than pleased when I hit ‘play’ on this latest instalment. Off the mark comes the stilton ridden Satanic samples, that tie in Rock music as the work of the devil in pure vaudeville fashion, reminiscent of the Thrill Kill Kult’s earlier leanings and one which will always be synonymous with the band. ‘Industrial’ was always a tag thrown at MLWTTKK and it is one that never really glued; mainly this was because of the bands inception at legendary Chicago based ‘WaxTrax!’ which just happens to be one of my all time favourite labels as well. However, hailing from that quarter as given the act a sort of underground legendary status, regardless of whatever avenue they tended to roll down. Now homed at the Italian based ‘Rustblade’ it’s a welcome relief to note that they have gone back to their roots; sleazy serpent like sliding grooves and rhythm’s infused with a rich rock feel that makes way for the less than serious in every expected way. 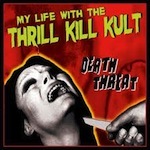 ‘Death Threat’ really isn’t threatening, but more trails on B-Movie mayhem and a cocktail of sexual innuendo, having a good time, go-go dancing, strip clubs and liquor; at least that’s what I get from it and as amazing as it isn’t as a release, this is a more than solid return to form and a nostalgic journey into a time when music was just fun and we all need a bit of that now and again.